Yesterday my plan was to finish painting the living room, but that project got held up. I know, I know, it's a trend. But it's not what you're thinking. I got caught in the middle of a caulk fight. For real. When the contractor was here last week, Jake asked him what we could do to make the crown molding look a little more new and a little less old. This is siliconized acrylic caulk. I had originally bought it to fill some of the cracks between the windows and the window frames, but it is perfect for this project and just what the contractor recommended. You can use it for interior or exterior and it's paintable (very important). 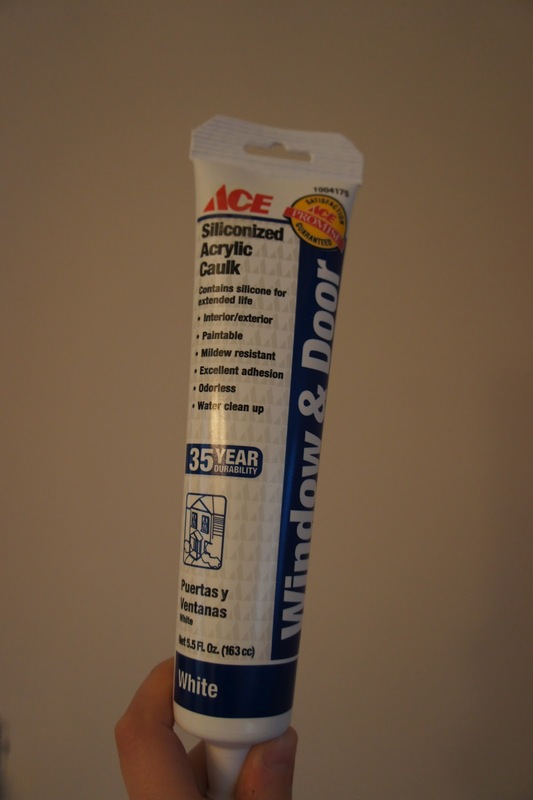 The back of the package says it can be used on window and door frames, siding, TRIM, vents, baseboards, corner joints, ducts, eves, and air conditioners. Yea, that about covers it I think. It worked okay, but if you try this, don't press down too hard or you risk cutting into the wood a little. Once I had all of the "old stuff" removed, I applied a line of caulk along the seams between the molding and the wall and the molding and the ceiling. I used a damp towel to wipe off any excess and smooth it out, and then I let it dry. The instructions on the package say to let the caulk dry for 2 hours before painting it with latex paint. I let it dry overnight and today I'm ready to start painting it. I'll let you know how it turns out!